is an advanced and comprehensive transport management software specially designed for a wide array of logistic companies. 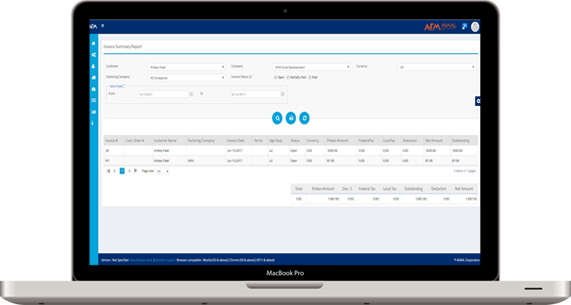 AFM Suite includes separate modules for invoicing, navigation and documentation helping you to increase your productivity and save time. Get all your invoices, taxes, compliance, maintenance reports all bundled in single trucking software. AFM helps you to take control of your expenses with a more comprehensive and intricate analysis of your business operations. Create Invoices/Receipts, Financial Reports & Balance sheet effortlessly. It helps businesses to streamline their planning, reporting and analysis processes to help improve strategic planning and reduce corporate budgets more accurately. Get a detailed report of your company’s performance metrics along with accurate factual calculations. With an easy to use interface, get an organized view of the expenses, income, and profits with real-time reports and dashboards. Our shipment tracking software or app feature navigates your assignments with ease and elevate your profit margins by reducing expenses and eliminating wastages. Never lose track of your drivers again. Increase customer satisfaction by delivering goods on time with our premium transport routing software. Forget about reminders and documentation. AFM Suite not only schedules your assignment at the tap of a button but also optimizes a seamless flow of operations. The interactive dashboard is suitable for Carriers, freight brokers, and freight forwarders. Our freight forwarding management software makes your logistics process smooth with the dispatching, Accounting, safety and compliance core modules embedded in it. Fleets and drivers get constantly updated about the schedule. Real-time notification helps them keep track of any updates regarding the assignment. Constant load tracking, checking stoppages and predicting accurate arrival times give you an edge over your competitors by maximizing productivity. Track your drivers during the assignment and help them find efficient routes by our skillfully designed route optimization software. The fleet monitoring software or app system helps you take control over your drivers. Organize all your key documents and access them from anywhere. With the help of newly added scan feature, drivers can easily upload documents, images, invoices, waybills and any relevant documents. Forget all your documentation hassles and let AFM Suite help you manage and integrate them in a seamless process. Monitor and track the movement of truck or carrier from the comfort of your phone. Provide accurate information about arrival times to customers, thus increasing transparency. Stay updated with any traffic and delays during the transit. Keeps you updated about any modification in the assignments. Drivers can easily communicate with dispatchers by creating alerts, thus solving a major issue of logistics management in India. With logistics software or app solutions, Stay a step ahead of your competitors with instant updates and alerts. Get in touch with us and our specialized customer care team will ensure you receive the best information possible. Request a demonstration or sales query or installation issues or any other relevant information you need, we are here to help. © 2017 Avaal Technologies India Pvt Ltd. All Rights Reserved.